Alfred H. Bloom, outgoing president of Swarthmore College, received an honorary Doctor of Humane Letters at this year's graduation ceremony. 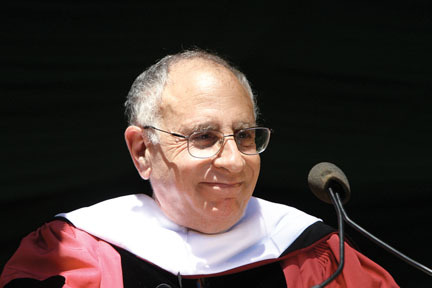 Alfred H. Bloom (watch: speech) received an honorary Doctor of Humane Letters. In her introduction, Provost Connie Hungerford said, “President Alfred H. Bloom, you have served Swarthmore College and its community with distinction for 36 years, as both professor and as president. Your leadership has been extraordinary; your imprint deep and indelible.” The following are Bloom’s remarks to the graduating class. I join you today in the singular privilege of receiving a degree from this remarkable institution, and in moving on, empowered by our Swarthmore experience, to apply our best selves to the world beyond Route 320 and the Crum. We have been molded by Swarthmore’s formidable intellectual power, by Swarthmore’s demanding ethical conscience, and by Swarthmore’s compelling responsibility to a common humanity. And I am persuaded we have been molded, as fundamentally, by Swarthmore’s intense multilayered care. An extraordinary commitment of care for the well-being of others binds the members of this community—a care anchored in the valuing of others, which transcends background, status, personality, and perspective; a care that quickly surfaces whenever a student is perceived as needing help; a care movingly expressed in the letters of evaluation students write for faculty, which consistently express how much, beyond educational impact, it mattered and how deeply it was the case that the faculty member personally cared; a care that can bring alumni to tears when they talk of personally transformative moments that took place here, of friendships forged, of partners found, a singular, ideal-affirming climate of care that assures those who return to this community that it is still the home they knew. And as I reflect on my own emotions at this my last Swarthmore Commencement, I know that among the greatest losses I will feel will be the loss of a community that has touched me so deeply through its care for its president. But this being Swarthmore, the impulse to care is more complex than it might first seem. For underlying that care for the well-being of others is a deeper level of care—not fundamentally protective, as the phrase “caring for” would denote, nor fundamentally cautious and limiting, as the phrases “take care” or “be careful” would suggest, but an optimistic and facilitative form of care, which wills to empower others to become their most realized selves. At Swarthmore, empowering others to become their most realized selves is a crucial part of what caring for their well-being means. From my first days as a member of the Swarthmore faculty, I remember how truly astonished and deeply moved I was by the intensity of care faculty colleagues invested in their students, not only to transmit knowledge and skill, but to support, challenge and guide each of their students to become the most precise, creative, and articulate thinker and the most fully realized individual she or he could be. Now, 35 years later, that prodigious investment of care by our faculty in their students continues unabated. The intensity of that care is recognized and appreciated by students and heightens their resolve to seek excellence defined in increasingly demanding terms, and faculty members’ willingness to join students’ own intellectual journeys imparts the confidence that they are valued for who they are and for the paths they envision and pursue. From those first days I remember, as well, being as astonished and as deeply moved at seeing students consistently reinforce each other for grasping and recasting complicated ideas, for producing exciting forms, for displaying rare qualities of interpersonal and organizational leadership. In marked contrast to other educational institutions I had known, where competition for grades, for admiration, and for status was the norm, Swarthmore students took genuine pride in their fellow students’ accomplishments, and constantly constructed reinforcing ways in which to offer critique and elicit insight and growth. Now, 35 years later, that care to empower fellow students is even more perceptibly at the heart of Swarthmore student life. At an institutional level, that same will to empower motivates Swarthmore’s extraordinary commitment to financial aid. And it is that will to empower that compels the College, in exercising its responsibility to a diverse world, to seek, beyond building an inclusive environment for a richly diverse student body, to empower each student, regardless of his or her identity and background, to become the most complete individual he or she can be. That will to empower also gives form to the two traditions that distinctively mark the culmination of the Swarthmore educational experience: Honors, which rather than serving primarily as a mechanism for evaluation, invites students into a dialogue with the scholarly world that regularly imparts intellectual self-confidence for a lifetime; and our own ceremony of Commencement, whose purpose lies not in attracting public attention, but rather in convincing you, the graduating class, through those who are entrusted to speak, to raise your aspirations for yourselves, and keep them raised, as high as you can. And it is that will to empower, as well, that primarily accounts for our alumni’s readiness to support this College in the many and essential ways that they do. What inspires their support is fundamentally neither nostalgia for the College, nor perceived obligation to it, nor desire to outdo others’ gifts or see their names in the Donor Report, but the will to empower faculty to be the most effective teachers and scholars they can be, to empower students to develop into their most accomplished selves, and to empower the College to be the finest institution it can be in facilitating those outcomes. I have often wished I had transferred to Swarthmore. How reinforced I would have been as an undergraduate who relished complex excursions in the life of the mind. And how affirmed I would have been as a young person just coming to recognize the impact that empowering rather than besting others can have on creating communities that build trust and inclusion, that release potential, and that emanate care. But Swarthmore’s will to care is even more complex still. For, at Swarthmore, fully developing capacities means more than mastery. It means preparing and committing to use those capacities, beyond self-interest, to extend the human legacy of effort to build a more knowledgeable, beautiful, productive, responsible, just, and cooperative world. At its deepest level, the College’s investment in young people is compelled by a care, at once idealistic and realistic, not only to empower them to be their most accomplished selves, but to transform them into determined contributors to that human legacy. Our faculty members contribute importantly to that legacy through their teaching and scholarly, experimental, and artistic work—and through the powerful model they set of constant intellectual and creative reach inspire their students to join them in the resolve to shape their lives in ways that will contribute, through and beyond their careers, to that legacy’s advance. Our students often come to Swarthmore predisposed to contribute to that legacy and, by their sophomore year, have already begun to pass on from their class to the next a culture at whose core is the injunction, drawn from the College’s Quaker tradition, “to let your life speak.” The initiatives they envision and undertake, with such frequent—at times world altering—success, constantly enlist new agents to that tradition of humane and societal advance. And the intensity of the care the College invests in bringing forth new agents of that legacy is intensified further by the expectation, constantly validated, that those new agents, beyond their own contributions, will, through the guidance and care they invest in others, in turn create a next generation of agents, extending a tradition of contribution and recruitment to the cause of humanity. What a vision of undergraduate education Swarthmore projects and delivers—one which not only cultivates intellectual power, ethical intelligence, and responsibility to broader humanity, but which also fosters a care for the well-being of others, a care to empower them, and a care to inspire and prepare them to take their places in a self-replicating tradition of determined agents of the human legacy. What a phenomenal example of what undergraduate education can and should be! I go from here to build, within NYU’s global network, a university of world distinction in Abu Dhabi, one which I hope will foster in an international context the full range of habits of mind and layers of care that so significantly distinguish Swarthmore. And as each of you goes off to contribute directly to educational, intellectual, and artistic advancement; to lead professions, enterprises and organizations; to shape societies and the world, I ask you to create, from the smallest to the largest scale, communities that care in the multiple and complex ways that Swarthmore does. Draw on what has proved so effective here: Care deeply about the well-being of your constituents! Find ways, whenever possible and reasonable, to say yes to their ideas and aspirations! And articulate precisely and persuasively the impact your community does and can have on extending our human legacy! Create the infrastructure of a more accomplished and caring humanity, and one determined, beyond self-interest, to advance a more knowledgeable, beautiful, productive, responsible, just, and ultimately peaceful world. Class of 2009, I look forward to crossing paths with you as we bring to the world Swarthmore’s confidence that creating communities that care is not a naive ideal, but a desirable, a necessary, and an achievable goal. I offer you my warmest congratulations on what you have accomplished and my congratulations in advance on what I know you will achieve.